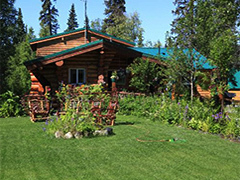 Alaska Wilderness Log Cabin Rental: Talkeetna Gate Creek Cabins with Mt.McKinley Views at Trapper Creek. Creek Cabins is a one-of-a-kind property that delivers the “Alaskan Experience” to our guests with all the comforts of home. 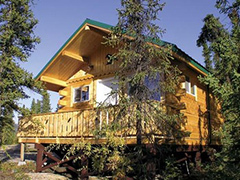 The Gate Creek Cabins are located near the premier tourist destination sites in Alaska–Denali National Park and Denali State Park. We are centered in the Petersville Foothills–the most popular area in the winter for snow machine enthusiasts. With year round road access, just 10.5 scenic miles off the Parks Highway, Gate Creek Cabins are situated overlooking two small stocked trout lakes. The peaceful setting offers guests an open panoramic view of Mt. McKinley just 30 air miles away. 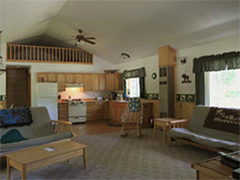 We have eight log or custom crafted cabins ranging from one to four bedrooms. Cabins sleep between 6 and 10 persons and have private indoor bath facilities. Clean, comfortable, and romantic cabins are completely furnished. Gate Creek Cabins are open year round. 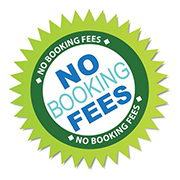 From November to April we cater to snow machine, and cross-country skiing enthusiasts. Guided trail rides, snow machine rentals, and premium fuel are available during the winter months. During the summer months, the beautiful gardens at Gate Creek Cabins create a great place for families to relax and enjoy a restful stay while visiting nearby Denali National Park and Denali State Park. It is the perfect setting for an outdoor wedding..